It doesn’t have to be hard at all, and having a few tools will make it easier! 1. Addressing Control Issues: Being in control feels like being in a place of power, and holding onto control usually demands that you have all the answers. We see this in business and political structures where it is considered “weak” to acknowledge that you don’t have all the answers. When you proceed as if you are full of answers, you often have little room to receive new information from others. 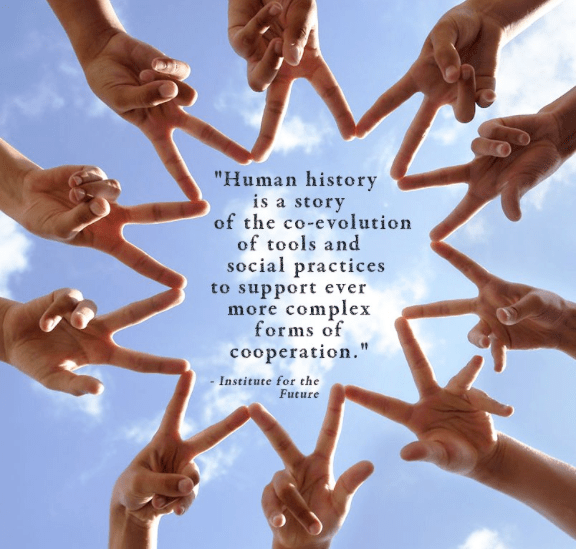 Cooperation demands that all input is considered and valued, and outcomes are emergent from the group; this requires letting go of control and allowing an organic process to unfold. This often brings up a deeper reason that people like to be “in control”, which is because it makes them feel secure. 2. Facing Insecurities: We often place our sense of security on outcomes rather than within ourselves. We feel secure if we know how things are going to go, if we are “in charge” of the situation, if we are the winners, and if we are the ones calling the shots. For cooperation to flourish, security must come from a deeper sense of trust in one’s self, in the group, and in the process. This involves stepping out of a purely individual perspective, recognizing one’s self as one part within the larger whole and allowing vulnerability to be seen as strength. That can be a tough concept, but it actually takes a very strong and confident person to be comfortable with vulnerability. We can cling to control situations in the hope of being secure, but inevitably we will find that the inherent nature of being human means that we are vulnerable, that we don’t have all the answers. Accepting this will give us a resilience, a confidence, and a strength to accept the insecurities we have – while overcoming them. 3. Holding Space for Whatever Arises: In the process of cooperating you will naturally always find conflict or people that have different ideas about the way things should go. Rather than seeing conflict as a battle with a winner and a loser, try to see it as an opportunity to consider multiple outcomes which strengthen what is being created. This means holding space for the process and for each individual participating in the process. It also requires a sense of feeling personally secure in one’s self without over-identifying with ideas. My ideas can be rejected and I can still feel good about myself, the group can be grateful for my input, even if they don’t embrace my ideas. 4. Awareness of Group Dynamic: This is about knowing yourself and having personal awareness first and foremost. Maybe someone in the group reminds you of your big brother who used to bully you? Maybe you are jealous of someone you are working with and don’t want to see them succeed? Maybe you have a low self-esteem and secretly wish to sabotage the process because it gives you a sense of power in the group to thwart forward movement? Calling others out on this behavior is often less successful than actually owning your own behavior. The group should allow space also for acknowledging the personal dynamic, and this means that it is okay to speak openly; for example: “You really remind me of my older brother who bullied me and I don’t want to see you that way.” This type of public disclosure reveals your vulnerability, it shows the group that you are willing to have it out in the open, and that you are aware of your own sensitivities. When this is welcomed in the group, the cohesion and sense of working together is increased as the group supports each other in their process. Article originally appeared on UPLIFT!